Sectarianism is a word which conjures up many different emotions, opinions and perspectives. The term can take on different meanings depending on how it is used. 1. Of, relating to, or characteristic of a sect. A denomination – or sect – is a division or grouping within a faith eg Protestants and Catholics within Christianity, Sunni and Shia within Islam, Orthodox and Reform within Judaism. Denominations within one faith share the same fundamental elements of the faith but have different practices or different interpretations of specific elements of that faith. 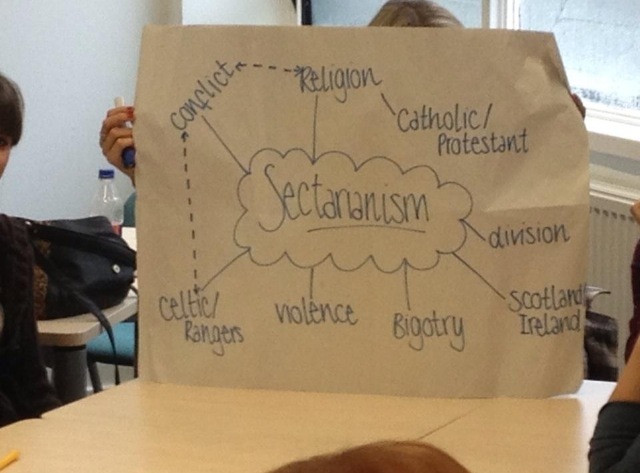 Sectarianism in Scotland is typically related to Protestant/Catholic divisions but it is helpful to understand that sectarianism also occurs within other faiths and is a feature of religious intolerance. Although sectarianism is rooted in religion it is often linked to cultural, historical and political differences. It is frequently argued that in recent years this type of intolerance of others has little link with history or association with religion itself.